Since 2010, we have led the effort to permanently protect the upper reaches of the Marico River. Legal protection was granted, consequently we are now able to expand to the broader Dolomitic Aquifer System of the North West Province of South Africa. This culminated into the designation of the Marico Biosphere Reserve on 25 July 2018 by UNESCO's 'Man and the Biosphere' management. We have achieved to get over 14 000ha in the upper reaches of the Marico River declared as the Marico Protected Environment in terms of the Protected Areas Act 57 of 2003. Twenty three land owners or entities signed on for this legal protection process. One farm is declared as Nature Reserve. The land owners of private Nature Reserves and other private land owners in the greater region have lately indicated that they are interested to form part of an expanded Biosphere Reserve of =+/- 440 000 ha. The Provincial Molemane Nature Reserve also forms part of this area. Prospecting and Mining applications and activities are confronted with the high emphasis on nature conservation and the uniqueness of the natural environment to be protected. Great emphasis is put on the protection of the Dolomitic Aquifer System of the region. The Tufa waterfalls and dolomitic eyes in the region are seen as entities for scientific research. Social development plays a major role in the implementation and management of the Biosphere Reserve for example the establishment of Edu Hubs in the more remote villages. The public participation process was followed with all Interested and Affected Parties. The biosphere reserve application was submitted to UNESCO on 30 September 2017 and the area was designated as the Marico Biosphere Reserve on 25 July 2018. This was a joint effort of the Marico River Conservation Association (MRCA), Landowners, the Provincial Department of Rural, Environmental and Agricultural Development (READ) and other stake holders. 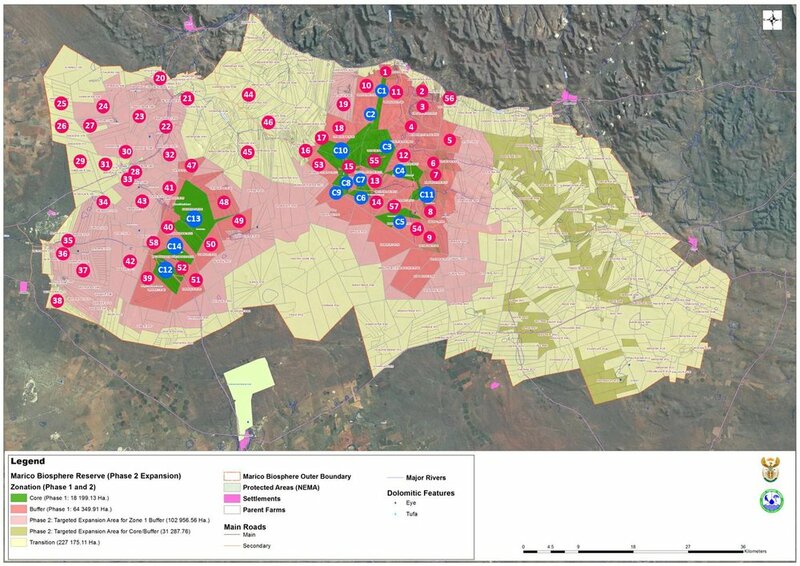 The UNESCO designation of the Marico Biosphere Reserve was celebrated on 12 October 2018 by landowners, different stakeholders, the communities of Groot Marico and Ottoshoop and the Department of Rural, Environmental and Agricultural Development (READ) who sponsored the occasion. Several guest speakers addressed the audience, among others, the MEC of READ and the Mayor of Ramotshere Moiloa Local Municipality. It is a great achievement for every one that was involved or that is living in the area. Page the slides to view the day’s celebration. MEC, Me. M Tlhape, expressed deep gratitude to the dedicated team that worked on the Marico Biosphere Reserve application. A brief presentation by Irene from MRCA on the Marico Biosphere Reserve with emphasis on the dolomitic aquifers. She also gave an outlay of the area map with a brief discussion on the biodiversity of and special features in the area. Cathy Dzerefos from WESSA gives an overview of the Eco-Schools programme in the Marico BR area which is aimed at whole school development and youth environmental awareness. JP le Roux from EWT gives an overview of their conservation and social development activities in the Groot Marico and Koffiekraal communities. They run a water quality testing program for the Marico River. 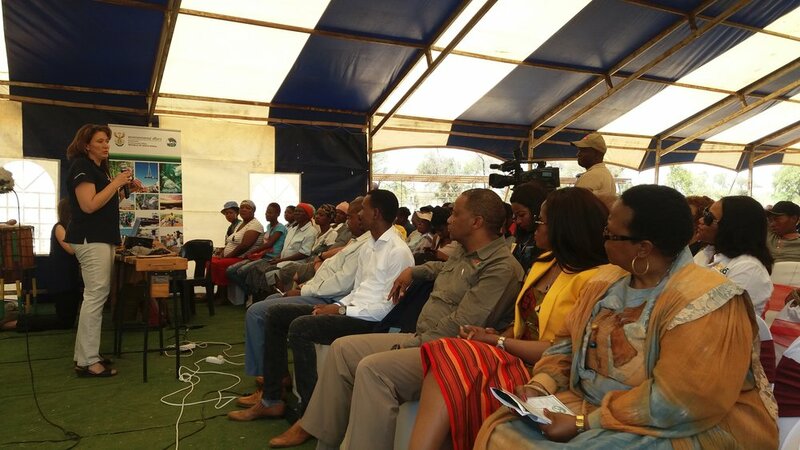 Elna from Bakwena elaborated on their involvement in community development and conservation along the N4 highway. They sponsored a member from MRCA for FGASA field guide training NQF2 level. Kereng from MRCA reminded the attendees from Ottoshoop of the public meeting ko setlhareng, when the heavy down pour prevented them from signing endorsements for the Marico BR. The MRCA invited learners from the Pakisang Primary School to attend weekend camps at Mulhajadi. These camps gave rise to the establishment of a conservation club and arbor day was celebrated in September. Gumboot dancers from Phenyo Botlhe Primary School where the Celebration was hosted. a,b. Community members from Groot Marico and Ottoshoop attentatively listening to all the information about the Marico BR. The MEC of READ tastes the prime water of the Marico Biosphere Reserve. It is from an Artesian Eye from the Monelieshke Farm near Ottoshoop. The water was awarded a gold medal at the International Fine Waters of the World competition in China in 2017. She is joined by the Mayor of RMLM Me Mothowagae and the Kgosi from Uitkyk.